Many of our personal training clients are avid cyclists. When developing their customized programs in the spring, we like to address weaknesses that can be limiters in the summer and fall (so they don’t become bigger issues!). Now is the time to lay important groundwork for the season to come. Performance improvement and injury prevention combine to form the pillars of an early season strength program, and here are some tips on how to address both. Strength training helps to improve overall performance on the bike through loaded patterns that mimic the range of motion when you ride. Sets can focus on endurance (lighter weight / higher reps), strength (higher weight / lower reps) or power (more explosive movements / plyometrics ). The most beneficial movements revolve around squats, step-ups, lunges and deadlifts. Cycling demands strong hip and knee extension so foundational leg workouts transfer great to improved strength on the bike. We often incorporate high box step-ups to get hips firing at “12 o’clock” in the stroke rather than using a smaller box and firing lower in the pedal stroke. In general big leg and hip moves (squats, lunges, deadlifts) work great. Most cyclists have a dominant leg and struggle to balance power and strength between both legs. Incorporating single leg squats and deadlifts as well as adding lunges can really help create more balanced strength. 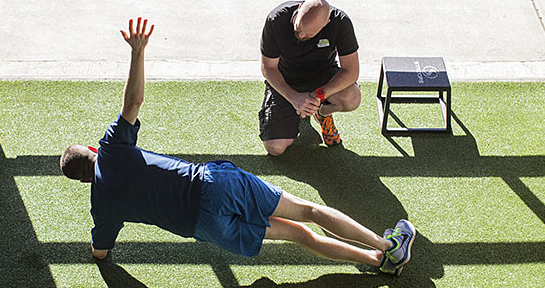 The most important part of strength and conditioning work is injury prevention. These are the moves that don’t always seem like they relate directly to cycling, and you may look awkward when performing them, but they achieve results. Cyclists tend to lack good lateral stability, are tight along the anterior chain (front side of body), are weak along the posterior chain (back side of body), and are poor extenders in the thoracic spine from being over the handlebars all the time. All are easy(ish) to correct and should get a lot of attention when you’re spending less time on the bike in the winter and spring. Hip stabilizers keep the knee tracking properly. This reduces risk of overuse injury and helps to maintain efficient pedal strokes. Band exercises are great to work on stabilizers. Monster walks and clams are classic exercises and can be done with very little space and equipment. Bands are also great for building back strength with exercises the facilitate mobility in the thoracic spine (mid back) and strengthen the upper back and shoulders. Shoulder separators, posterior flies and one-arm rows with bands or cables all help to address postural issues that creep up to cyclists over time. Traditional bodyweight exercises like low planks on your elbows, high planks on straight arms and side planks help to address many of the elements we’ve mentioned with zero equipment, minimal space and a pretty low time investment. These exercises will build core strength, which is so important for a healthier ride. Taping two lacrosse-style balls together and working on mini-crunches with the balls placed at various points along the thoracic spine may be the single best activity you make all day. This movement promotes extension in the thoracic spine and can help tremendously to counter the negative effects of riding positions on the back and shoulders. Hips flexor stretches and foam rolling work go a long way towards countering all the flexion cyclists do at the hips. These stretches and foam roll techniques are easy to implement daily, especially after long periods in the saddle. Hip flexors are often ignored because they are not the big “action” muscle groups, but they play a huge role in longevity, comfort and performance! A regular routine of dedicated strength training may just take your riding to a whole new level! To make this all very simple, we’ve put together a guide with a series of key exercise, stretching and foam rolling techniques. You only need to perform these exercises one or two times per week for 20 minutes or less. In that short period of time, you can achieve most of the suggestions from this article. One session with our personal trainers can help dial in all the flexibility and mobility movements and get you well set up for success. Hyatt Training is a Portland personal training gym that offers one-on-one personal training and coaching programs for busy people like you. We blend art and science to create programs that are applicable to life and sport. 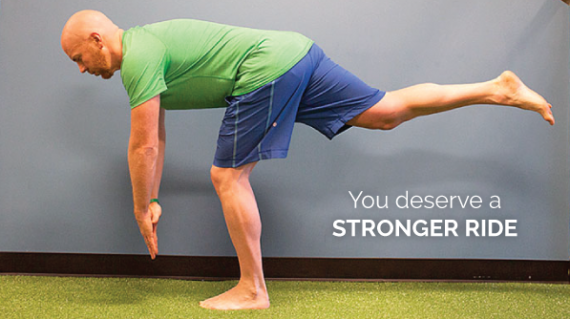 We bring together strength and conditioning, cardiovascular health, yoga and nutrition to deliver a comprehensive lifetime health and wellness strategies. Injury prevention training is really important for who is looking long term safe cycling. The Therapeutic Exercise is also nice thing.